ATV Tires Wheels Kits - Buyer's Guide and Best Deals. ATV Tires Wheels Kits - Buyer's Guide. Kits to replace stock ATV tires wheels are one of the most popular accessories on anyone's wish list. Since these combo kits are a great "bang for the buck", that seems reasonable to us. Now that we've convinced ourselves we really need these, let's take a closer look. If you just want to see the best deals online right now, click on the link below. 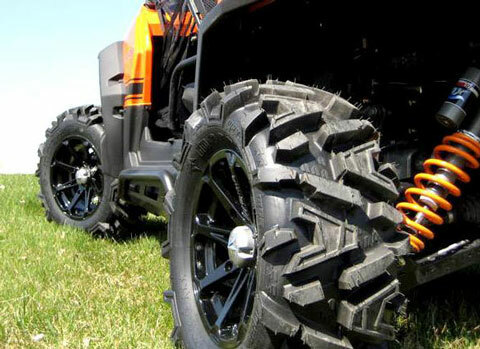 Improve looks and performance with ATV tire and Wheel Combo kits. The first thing you'll notice is that most combo kits for ATV tires wheels offers a choice of 12" or 14" diameter sizes. So which one do you need? That depends on what type of riding you plan on doing and how much money you want to spend. The 12" kits are probably the best pick for the majority of riders. There's an almost unlimited choice of tire tread types, and the 12" sizes are usually less expensive. The 12" ATV tires/wheels will retain close to a "stock" feel for ride and handling. For riders that are happy with the overall performance of their ATVs and just want to upgrade the stock wheels and tires - the 12" diameter is the way to go. The 12" sizes rarely cause any clearance issues and almost never cause any ride or handling problems. They're about as close to a no-hassle modification as possible. But what if you want to split mud holes, scale huge boulders, or ride terrain that looks like a moonscape? Then you would be a candidate for the 14" size ATV wheels and tires. The most serious mud tires will be found in the 14" size. And if you need all the ground clearance you can get, the 14's are what you need. But a word of caution - be sure to check tire clearance with the fenders and steering and suspension components first. The 14" size ATV tires/ wheels can have some other negative effects too. Raising the ride height of your ride will reduce stability while cornering and may cause a feeling of "tippiness". The bigger size wheels and tires also require more energy to accelerate and brake than the smaller sizes. As we've said before, like so many of these mods, it really comes down to your riding priorities. Our personal opinion? For the great majority of riders, the 12 inchers offer the best combination of tire choice, ride and handling, and price. However, if your normal riding areas would be considered "extreme", then the 14" size will be the best choice for you. Or maybe you just like the looks of the bigger wheels and tires. Fair enough - it's your money! Something We Can All Agree On - Best Deals! Since we've established that ATV tires wheels kits are a good value, all that's left is to find the best possible deals out there. It seems like every time we go looking for the best prices, we end up at Ebay Motors. This time is no different, so we came up with the custom link below that already has the best, best deals listed. Just remember that's it always a good idea to contact the sellers before you buy to make sure the combo kit listed will fit your particular ATV.